The role of platforms can no longer be excluded from debates on the future of organizing work. I predict that labor of every sector will –at least partially– be organized by platforms over the years to come. Not only by external platforms, but also internal (white label) platforms catering for the organization of both the flexible and the fixed shell of organizations. The gig economy is a bright mix of flavors and more are to be added soon. All in all, it sounds like an interesting list of statements and maybe you do experience it as a major setback we’re not all going to be giggers in the end. But, to say the least, this didn’t take me by surprise. Why? Because the listed items aren’t very substantial. I started to write an article on the individual points, but soon I realized that such wouldn’t contribute to a constructive and informative analysis. Therefore I would rather point out why these kind of generic researches do not contribute to the public debate. 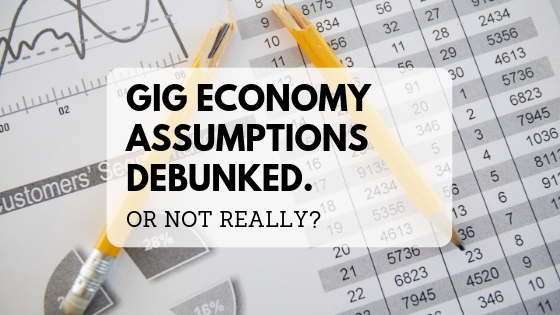 There is much talk about the ‘the’ gig economy, but it is hard to make any statement on the gig economy in general. Why? Because every industry and each kind of platform has its own dynamics, including its individual opportunities and challenges. Still we fall into the trap of generalizing. The very same thing happened during a meetup regarding a Dutch documentary on the gig economy (to be seen here) last Thursday in Amsterdam. Initially the conversation wisely started by mentioning these broad dynamics, just to throw all caution overboard and keep on generalizing. The way things happen to be. Is the platform willing to cooperate with established institutions or not? 2 . ‘The’ platform worker is nonexistent. Neither is there a platform generation. At the meetup, a cleaner formerly working with cleaning platform Helpling (now suing the very platform) and a cook actively working with gig platform Temper joined the table. These two platform workers wonderfully illustrated the dynamics of the platform workers’ world. On the one hand the domestic cleaning lady feeling dependent and controlled by the platform, moreover carrying the feeling that she is unable to do anything else, and disappointment over the platform not hiring her. On the other, the cook possessing unique skills, exactly knowing how to squeeze out every little bit of what the platform has to offer, skillfully profiling himself and enjoying the optimal freedom and flexibility of working via a platform. Measuring both platform workers with the same yard stick would be pure nonsense. Just like the enormous diversity within the platform economy, also ‘the’ platform worker is a very broad concept. Furthermore, it is very important to understand how this ‘worker’ would have functioned outside of these platforms. In other words, is the platform a worsening or (at least) some enrichment to the opportunities of supplier? Resulting from EY study, quoted several times in the HBR article by the EY author, among the respondents of the generation of millennials ‘only’ 24% earn money within the gig economy and that “the percentage of millennials with full-time careers is rising at a brisk clip from 45% in 2016 to 66% in 2018”, according to their collected data. I am in the blue of the origins of the assumption that certain generations would be more or less ‘gig’ sensitive, but I do think –which surely is an assumption as well– that it is not advisable to project such far-going expectations on a complete generation. Even though this generation is digitally a lot more skillful than the previous and is raised more self-reliant in believing the sky to be the limit –which does influence their mindsets– it still does not imply that this generation would massively show forth a change in behavior. Besides, every individual processes through several phases of life while his or her priorities shift between different areas. I compare it with the assumption that the ‘new’ generation does not like to own a car and prefers access over property. Nothing wrong with that as long as you do have but a few obligations, yet when time comes –as is my personal case– that you settle to start a family, have children, etc. the priorities begin to shift and other topics become important. Those priorities will logically change per life stage. Similarly, one changes his mind when looking for either greater flexibility or more certainty, independent of being a millennial, or generation X, Y or Z. Talking about the gig economy used to be clear and straightforward. Platforms like Uber, Deliveroo and Helpling were all there was. It couldn’t be more convenient. The trend nowadays is platforms mixing in with the ‘traditional’ matchmakers. Dutch gig platforms Temper and YoungOnes platformize specific categories formerly organized by the employment agency industry. The next step being platforms organizing the flexible shell of organizations and consequently the full workforce of organizations, also because fixed personnel can be organized more efficiently by use of a platform. Parallel developments are found in the rising use of algorithms for selection procedures, as implemented by several publicly traded companies, and the use of artificial intelligence. Whereas the gig economy used to be rather isolated about roughly one year ago, making it relatively easy to identify, I now predict platform thinking as a mindset and technique to play a rapidly growing role in every industry in the years to come, both behind the scenes and in the open. A movement not restricted to the platform start- and scale-ups currently using these techniques, but also within existing organizations. We should realize that there are great opportunities to a) redivide the market, b) increase the market and c) improve the opportunities and position of workers. I’m still disappointed about the measure of awareness within the entire sector, in strong contrast to the mobility industry. It goes to show that the manifold gig economy is not to be wrapped up in a few one-liners and that it is high time to continue the debate on a different level.